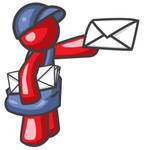 Todays Friday Five is all about your email! I’ve also provided a few updates on the sidebar. I’ve been doing very well with my savings goal. I’m still falling short on my blogging income goal. But I am investigating a few more ideas. 1. What’s the number of email addresses you have? 2. Do you have a top priority one? 3. How many unread messages are in your inbox? 4. Do you have folders set up? 5. What was your very first email address? 1. I have one email each for work, gmail, yahoo, blog, college and Mary Kay. So that’s 6! 2. Gmail is my top email because it’s my newest one and I get the least amount of spam in that one. 3. I currently have 11,850 unread messages. I’m glad those aren’t pieces of real mail! 4. I have folders set up for Groupon, Coupons, my Blog, Mary Kay and Investment Properties. I NEVER look in said folders. 5. This one is funny. The first email address I created was PotentialLexusOwner@hotmail.com. I used to love those cars when I was young! Ok, your turn! I’d like to know all about your email! Or at least let me know how many unread messages you have! I’m still over here LOL’n at your 1st email address!!!! Too funny. Here are my email stats…. 1. I currently have SIX active email accounts. I have to check them all on a daily basis. 2. Well, since checking my “Work” email acct is essential to my FT job. Im not going to count that one. So my main email is my Gmail acct. I use gmail for everything. This serves as my official “personal” acct. 5. I think my very 1st email address was astral46@hotmail.com. But I also created that acct at the same time I started college. So not sure if my U of I school email address came 1st or not.